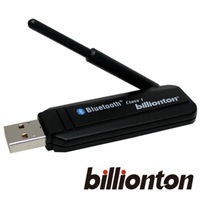 This is a Bluetooth USB Dongle with class 1 output power. It uses Broadcom BCM2035 single chip Bluetooth IC and is Bluetooth v1.2 specification supported, and works on 2.4GHz ISM Band. It works in notebook and desktop PCs. Simply plug it into notebook or desktop PCs’ USB connectors; you can then use the many profiles provided and communicate with other Bluetooth devices without the tangle of cables. It will empower your information application with more mobility.